An optometrist from British Colombia, Dr. Garth Webb, is currently developing a bionic lens, that once implanted would give a person 3x 20/20 vision, regardless of their age. The bionic lens, called the ‘Ocumetics Bionic Lens’, would end the need for glasses, contact lenses, driving glasses or progressive lenses and would allow for optimal eyesight regardless of an individual’s age or health, according to CBC. Additionally, those that elect to get the bionic implant will be assured of never getting cataracts, as the new lens actually replaces that of the natural eye. Webb developed the lens as a means of optimizing eyesight, and says that anyone over 25 is a good candidate for the procedure, as that is when the eye has become fully developed. The lenses will be custom made for each individual. The surgery can be done in as little as 8 minutes and the results are immediate, according to Webb. The lens itself is folded like a taco and put into a saline-filled syringe, where it is then placed into the eye where it then unfolds itself within seconds. Webb says that his work borders on “obsession,” as he wishes to free himself and others of the burden of corrective lenses, which he has personally worn since second grade. Webb told CBC that the project has been in development for the past 8 years and has cost roughly $3 million in research and development. Recently, Webb’s new technology made waves in the ophthalmology world after presenting the lens during a meeting of the American Society of Cataract and Refractive Surgery. According to Webb, surgeons across the world were intrigued by his bionic lens design. The Bionic Lens could be available within the next 2 years in the US and Canada, pending results of clinical trials in animals and blind humans, according to Webb. Webb hopes that this new technology will revolutionize eye care, potentially alleviating any need for laser eye surgery in the future. “Perfect eyesight should be a human right,” Webb said. 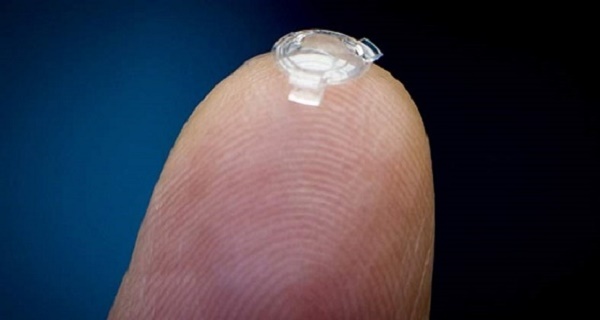 Do you think these bionic lenses are the first step to the creation of bionic superhumans? Let us know your thoughts in the comments below!